I don't really understand cucumber. I mean, I don't hate it, I'm more indifferent to it. I'll eat it if it's in a salad, but I won't go out of my way to consume it. It just seems so pointless, it's mostly water, it doesn't taste good, but it keeps popping up everywhere. Take this bottle of Sprite for instance. If you asked me what would be a good addition to Sprite, I would go with another fruity flavor. Not in a million years would I suggest sticking cucumber in there. But here we are. What more can I say? This is Sprite with cucumber flavor added. It's a variation on Sprite Zero, so I guess this is something to appeal to those on a health kick. I must say, it does taste a bit like cucumber, but that flavor overwhelms everything else. The lemon and lime are muted, and altogether it makes for a pretty bland drink that tastes a bit too much like cucumber. 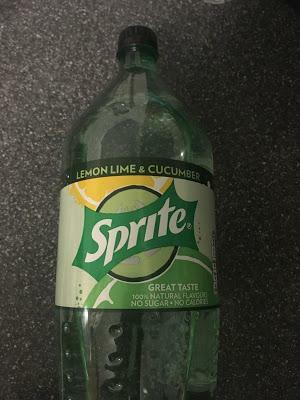 Not a great variation, I look to Sprite for my lemonade fix, not to get a cucumber experience. Stay out of my soft drinks.